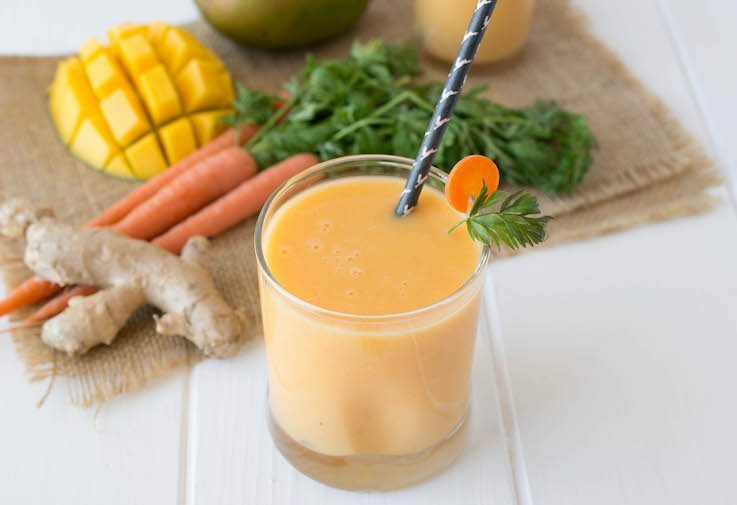 This Mango, Carrot & Ginger Smoothie is a delicious and nutrient-filled breakfast or workout snack. Healthy fruit & veggies are blended smooth along with added protein from Greek yogurt. What’s better than a fruit smoothie? A fruit and veggie smoothie with Greek yogurt for added protein. This fruit smoothie is packed with nutrients . Plus, you don’t have to wait for everything to be in season because the fruit and veggies are available right from the freezer section of the supermarket. 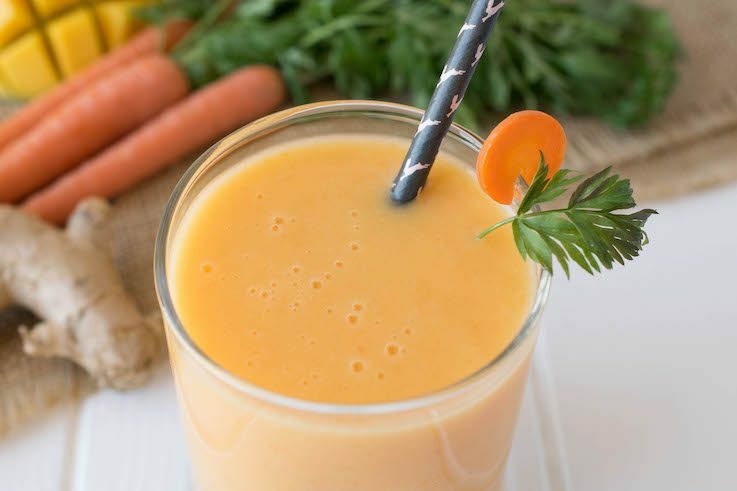 Mango and carrot may seem like an odd coupling, but they actually make a delicious combo. Vitamins A & C as well as fiber are all packed into them. So why not drink your nutrients? Just like my friend and I, you would think that fruit and vegetables would not get along, trust me, they do and they do very well in my smoothie. This smoothie has become my new pre and post workout snack and to make my life easier. 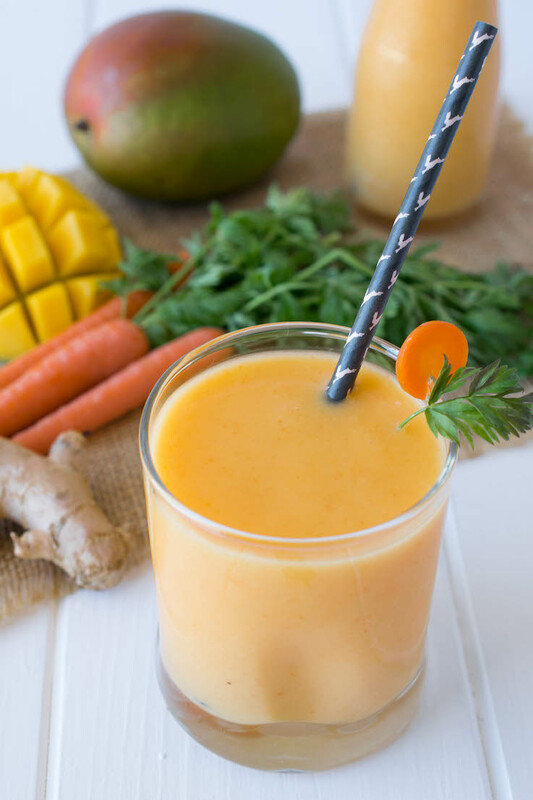 If you’ve tried this Mango, Carrot & Ginger Smoothie or any other recipe on the blog, then don’t forget to rate the recipe and let me know it turned out in the comments below. I love to hear from my readers! Healthy fruit & veggies are blended smooth along with added protein from Greek yogurt. Add all the ingredients to a NutriBullet or blender and blend until smooth. I LOVE smoothies! In the summer I often have one for my breakfast or lunch, along with a mug of green tea. Today it was mixed berry. Mangoes – my favourite fruit! I buy a case of mangoes and when they are ripening I make up a collection of single servings in ziplock bags to freeze, so I always have some handy. If I use frozen berries, they don’t always blend easily so I pour a little boiling water onto them. Quantities – half and half, fruit and soy milk (Soy Milky Lite) because I am dairy intolerant. 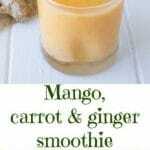 I haven’t tried carrot and ginger with the mango, but I’ve just added ginger to my shopping list! Thank you for the hint. I need to get the Dole frozen fruits and veggies! They are so convenient for smoothies! 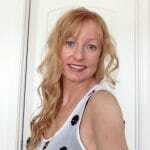 Love this one! Mangos are one of my favorite fruits! I could eat those all day! And I’m loving how quick and easy it is to throw this together – perfect for rushing out the door during the week!